The Super Bowl is just around the corner, and it seems like everyone is getting swept up in football mania, particularly fans of the Green Bay Packers and the Pittsburgh Steelers. But the NFL wasn’t always the only game in town, as today’s guest blogger, Steven Faulk, explains. Faulk collects vintage football programs, mostly from the long-defunct All-America Football Conference. You can see more of his collection on Show & Tell, as well as his FanBase page. My dad played for San Jose State from 1946 to ’49, and kept every program from all the games that he played in. That’s how I got into collecting vintage football programs. I played for the Spartans in the early ’70s and kept my old programs, too. Even though the ’70s programs are collectible now, I like the older ones even better. I’ve got Spartan programs from 1935 through the ’90s. The 1939 and 1940 San Jose State programs are real prizes because SJS was one of Glenn S. “Pop” Warner’s last stops as a coach. Along with former San Jose State Spartan and 49er coach, Bill Walsh, Pop Warner is considered one of the great innovators in the game of football. Being a Northern California native, I’ve always been a “49er Faithful,” and I like to collect their programs from their pre-NFL days, back when they were with the old All-America Football Conference. 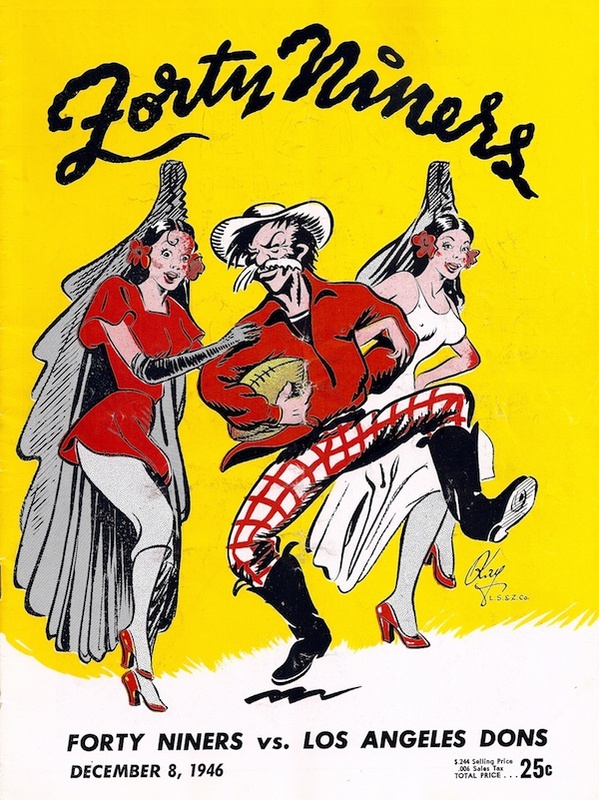 The 49ers commissioned artist William Kay to do the covers on their programs from 1946 through ’48. 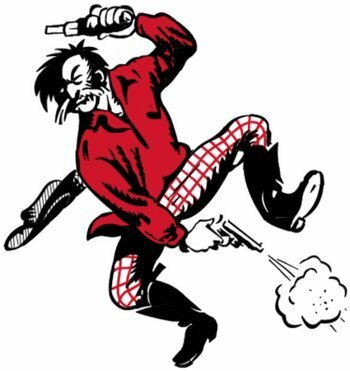 The 49ers mascot, originated by Kay, was “Sourdough Sam,” a salty old prospector. On Kay’s covers, Sam was usually getting the best of a rival’s mascots. One of my favorites is the 1946 Forty Niners vs LA Dons program, pictured above. Sam has used his charms to attract two of the Dons’ women—presumably, away from the Dons. On Kay’s early programs, he would put the letters “L S & Z co.,” which were the initials of the Berkeley print shop that produced the programs. He dropped the initials after the ’46 season and simply signed off as, “W. Kay.” In the 1946 Dons game, the Niners pounded them 48-7. During the ’49 season, the 49ers employed an artist named L. Macouklard to do their covers—he did San Francisco street scenes. In 1950 and ’51, Vic Anderson was hired to do 49ers covers, which also featured different San Francisco city scenes. Vic also did covers for San Jose State programs in the early ’50s. As far as the old All-America Football Conference went, the AAFC and the NFL realized their competition was hurting both leagues, so they merged in 1950. The Brown, Colts, and 49ers went into the NFL, and the rest of the teams disbanded. Old AAFC programs, as well as being rare finds, are always colorful and fun. Many of the players ended up having illustrious careers in NFL, and a few ended up in the Hall of Fame. Got football fever? Don’t miss our senior editor Ben Marks talking about Super Bowl memorabilia in the Fort Worth Star-Telegram. Then, peruse our category pages on the Super Bowl, the Packers, the Steelers, and more. Sounds like an expensive hobby. Your wife must be a saint! Real Hollywood Thriller: Who Stole Jaws? “ ” This pleasure comes from being deceived, and knowing you're being deceived in an artful way.